Bismuth is a brittle, pinkish-white, crystalline metallic element that occurs in nature as a free metal and in various ores. Bismuth is the most strongly diamagnetic element and has the highest atomic number of all stable elements. Its atomic number 83; atomic weight 208.98; melting point 271.3°C; boiling point 1,560°C; specific gravity 9.747; valence 3, 5. Bismuth is the most naturally diamagnetic element, and has one of the lowest values of thermal conductivity among metals. Bismuth metal has been known since ancient times, although it was often confused with lead and tin, which share some physical properties. The etymology is uncertain, but possibly comes from Arabic bi ismid, meaning having the properties of antimony or the German words weiße Masse or Wismuth (“white mass”), translated in the mid-sixteenth century to New Latin bisemutum. It is used to make low-melting alloys for fire-safety devices. Bismuth was discovered by an unknown alchemist around 1400 AD. Later that century it was alloyed with lead to make cast type for printers and decorated caskets were being crafted in the metal. Bismuth was often confused with lead; it was likewise a heavy metal and melted at a relatively low temperature making it easy to work. Georgius Agricola in the early 1500s speculated that it was a distinctly different metal, as did Caspar Neuman in the early 1700s, but proof that it was so finally came in 1753 thanks to the work of Claude-François Geoffre. 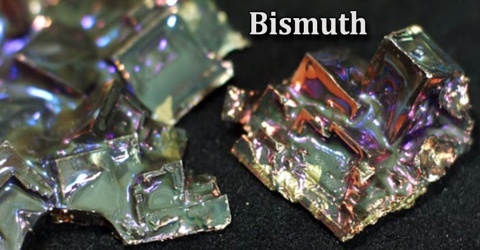 Pure bismuth’s brittleness makes it ineffective in metallurgical applications. However, small amounts are used as additives in copper, aluminum, iron, and steel to toughen and make alloys that are more machineable. In the Earth’s crust, bismuth is about twice as abundant as gold. 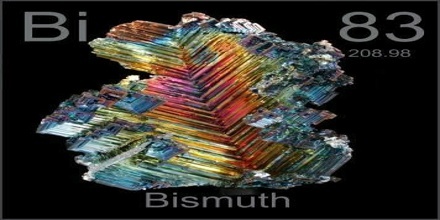 The most important ores of bismuth are bismuthinite and bismite. 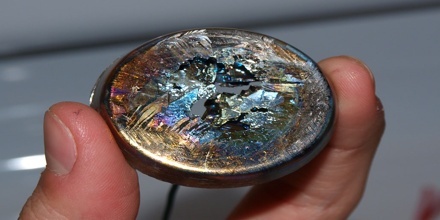 Native bismuth is known from Australia, Bolivia, and China. Demand for bismuth was small prior to World War II and was pharmaceutical – bismuth compounds were used to treat such conditions as digestive disorders, sexually transmitted infections and burns. Minor amounts of bismuth metal were consumed in fusible alloys for fire sprinkler systems and fuse wire. Bismuth is considered ‘stable’; it is radioactive and has a half life a billion times longer than the age of the universe. This just means that every 1.9×10^19 (19,000,000,000,000,000,000) years, half of a sample of bismuth will no longer be bismuth. In other words, this stuff isn’t going anywhere anytime soon. Bismuth’s electron configuration causes it to be a member of the 5th family (N, P, As, Sb, Bi) on the periodic table, and as such has the ability to form three stable bonds. Bismuth is a substance used in medicines to treat diarrhea, nausea, and indigestion. When Bismuth is combined with some other elements, such as oxygen, numerous salts are produced which are used in the manufacture of many pharmaceutical substances. Bismuth has few commercial applications, and those applications that use it generally require small quantities relative to other raw materials. Its alloys with tin or cadmium have low melting points and are used in fire detectors and extinguishers, electric fuses and solders. 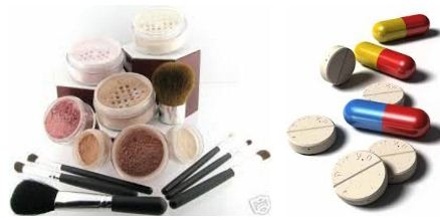 Bismuth oxide is also used as a yellow pigment for cosmetics and paints, while bismuth(III) chloride oxide (BiClO) gives a pearly effect to cosmetics. Basic bismuth carbonate is taken in tablet or liquid form for indigestion as ‘bismuth mixture’. Bismuth is also used in aluminium-silicon cast alloys in order to refine silicon morphology. Some bismuth alloys, such as Bi35-Pb37-Sn25, are combined with non-sticking materials such as mica, glass and enamels because they easily wet them allowing to make joints to other parts. Reference: study.com, thebalance.com, elementalmatter.info, dictionary.com, wikipedia.